Infrastructure is a prime consideration when a company decides where to locate its corporate headquarters or major high wage service industry facility. A range of public policy arguments exist to support the use of public subsidies to develop infrastructure for private development. First, infrastructure investment spurs productivity growth of employees and companies at a specific location. Public capital is seen as an input in the production in private firms. Public infrastructure investment enhances not just individual growth of private firms but also the economic growth and vitality of a region. Specific to the high wage manufacturing industry, infrastructure investments supports the expansion of manufacturing output and the employment growth in this industry. Location theory supports public infrastructure investment as an essential economic development tool needed to reduce the cost of doing business for area businesses. Often known as the central place theory, economic success of a region is determined not just by how close the region is to major economic centers but how quickly customers and workers can be linked to those economic centers through infrastructure such as the Interstate highway system, state highways, rail connections and airports. This infrastructure investment benefits urban and suburban centers and eliminates the economic isolation of rural communities. Different industries require different infrastructure investments. Beyond the traditional roads, water, sewer and telecommunications infrastructure, corporate headquarters and global trade and tourism conventions focus on slightly different infrastructure needs such as airports. Airports have a major economic impact on a community. Long-term corporate headquarters regional leaders and emerging regions are growing high-wage jobs in part because of the global connections provided by their airports. Most are publicly owned and are organized as a port authority. Airports support the travel and tourism business of a community. Airports employ thousands of workers directly through airlines, airline suppliers and airport officials. Finally, as port authorities, airports can be a public finance resource for a company searching for tax exempt financing. All states have airports. In a global economy, airports act as a link for high wage service jobs to the world. Ease of travel matters to corporate executives not just for themselves but for their team. Commercial airports link the movement of people, goods and services to the world. Approximately 490 commercial airports in the United States support 10.5 million jobs, create an annual payroll of $365 billion and produce an annual output of $1.2 trillion. Philadelphia’s selection as the home for the 2016 Democratic National Convention illustrates the challenge mid-sized cities, like Columbus, Ohio, face in global competition. Columbus, Ohio made the final list of three cities under consideration but was not chosen. While Philadelphia has four times the number of downtown hotel rooms as Columbus close to the convention site, Columbus’ application suffered for a lack of direct commercial airline flights. Direct commercial airline flights are a critical measure for global conventions as well as advanced service companies. 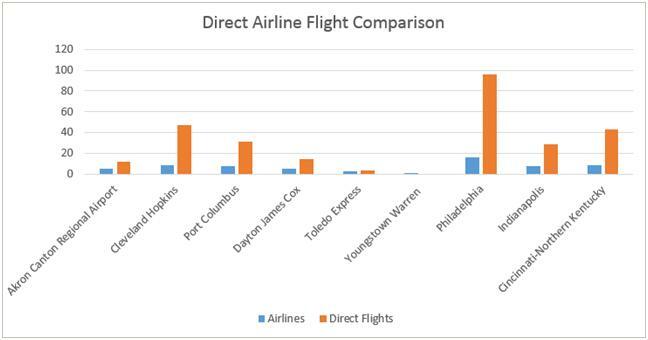 States like Ohio are clearly suffering from global airline consolidation. Industry consolidation has made air service expansion difficult. According to a recent City of Columbus report, over the past 14 years, airlines have consolidated from 10 major carriers to four with these carriers capturing nearly 90 percent of the domestic air market. From 2007-2012, these practices have resulted in cuts of 1.4 million domestic flights and the elimination of nearly 100 million domestic seats. Booming regional airports in Cleveland and Cincinnati are suffering with the decline of the status as a hub for United Airlines and Delta Airlines respectively. Columbus’ airport is illustrating slow, steady growth. Of greater concern, airports in Dayton, Toledo, Akron-Canton and Youngstown are suffering dramatic losses of air service. The economic success of Ohio’s mid-sized cities and their surrounding rural communities is very much in question based upon the struggles of their airports. The deregulation of the airline industry creates opportunities and threats for regions working on building advanced service and travel and tourism based economies. Many airports are looking to develop strategic plans focusing on financing direct air service with local business and government funding; developing direct links to key spots in the community such as downtown or the convention center from the airport; developing a package of economic development incentives targeted at commercial airline related companies; developing logistics initiatives around intermodal facilities; developing aviation industry workforce training programs and creating economic development districts in and around regional airports to capitalize on special tax exempt benefits of port authorities. Federal Aviation Administration restrictions impact the recruitment of airlines to airports, but the region itself can impact the development of more direct flights through these programs. Author: David J. Robinson is the principal of a business consulting firm known as The Montrose Group, LLC and author of Economic Development Policy from the State & Local Perspective. He is an adjunct faculty member at the Ohio State University teaching a public policy course on state and local economic development policy at the John Glenn School for Public Affairs.